Whether you can’t afford Microsoft Word ( , $180), don’t like it, or just find yourself without it on one of your Macs, Apple’s Pages ( ); part of the $79 iWork suite) offers some similar features. For instance, if you want to work with others on a document, Word’s track changes feature isn’t the only game in town. Pages can’t merge or compare documents. It's limited to marking changes, as well as recording notes and highlights. But this might be all you need. Better yet, you can share marked up Pages documents with Word users and vice versa, so you’re always ready to collaborate. To activate change tracking in Pages, open a document and choose Edit -> Track Changes. You’ll see a new toolbar appear. In Pages, this is a narrow strip below the main toolbar that contains the editing controls you can use. Need to add an editorial comment to a document? Insert comments by choosing Insert -> Comment and typing text. Your insertion point (whether it’s a block of text or just the space between two words) becomes highlighted and a yellow line connects this highlighting to a bubble in the document’s left margin. (Although the bubble looks more like a sticky note.) This distinct coloring makes comments easy to distinguish from other changes, which appear in blue by default. Pages' display of tracked changes can be a bit more readable than Word's. 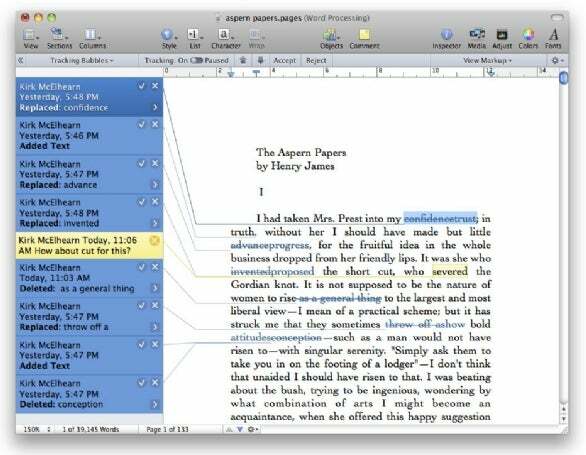 Pages offers one customization option many Word users long for: you can choose—with some selectivity—whether or not to display tracking bubbles. When you’re making changes, or editing changes, click on Tracking Bubbles in the change tracking toolbar. A menu appears where you can select from Show All (to display all tracking bubbles), Hide All (to hide them), or Show Only For Selection. This practical option makes it easier to follow your changes. You can, for example, select one paragraph at a time and view the bubbles that apply only to the selection. Pages also lets you show and hide change bubbles easily, something that Word only does when you change views (or if you change a setting in the preferences). To hide change bubbles, click the << button at the left of the tracking toolbar, or choose View -> Hide Comments And Changes Pane. There are a number of ways to accept or reject changes. Control-click on a change and choose Accept Change or Reject Change in the menu that appears. Click on the Next and Previous arrow icons in the tracking toolbar and then click on Accept or Reject. You can also click on the check or x button in the tracking bubbles to accept or reject changes. To accept or reject all changes in one fell swoop, click on the gear icon in the tracking toolbar and select from the menu that appears. You’ll find tracking changes most useful when you need to distribute a document to a number of people. While many people in business use Microsoft Word, this isn’t the case for everyone. Luckily, tracked changes made in one program usually appear in the other without problem—as long as you stick to Word’s .doc file format. In my tests, I used Pages to open a number of .doc files with complex changes tracked with Word. I also saved a number of documents tracked with Word in Pages. In almost all cases, change tracking and comments showed up correctly in both programs. Pages even opened Word’s newer .docx format documents without a hitch, though it can’t save in that format. The only limit to this sharing is the amount of complex layout the documents contain. Since the two programs have different layout features, some graphic elements may get lost in the shuffle. However, for most text-based documents, tracking changes works as you’d expect it should between the two word processors.